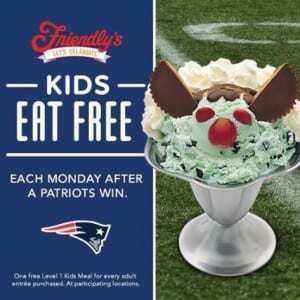 On Sundays this Patriots Season when the Pats win kids can eat free each Monday the day following a Pats win at Friendly’s. This promotion is available at select Friendly’s locations in Massachusetts, New Hampshire, Rhode Island, Vermont, Maine, and Connecticut. Free kid’s meals include the choice of one drink, an entrée, and one dessert. For more information or to find your nearest location, please head here.